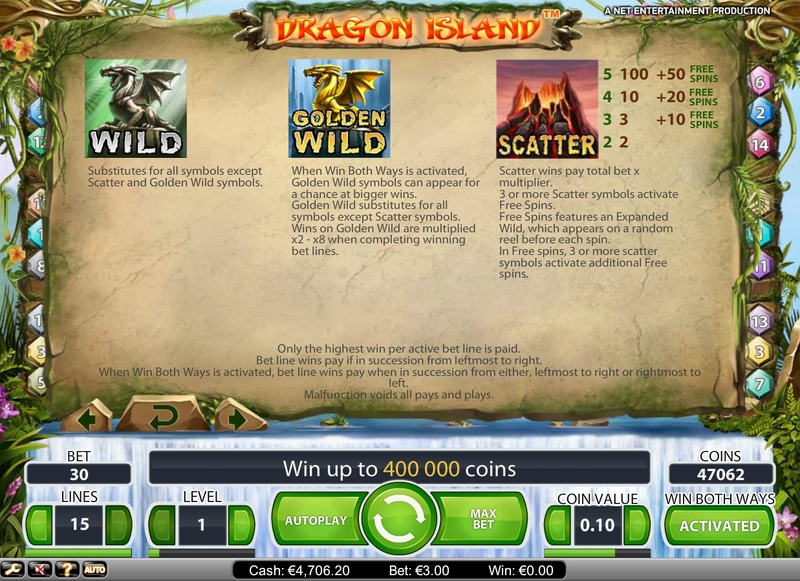 When it comes to free online slots, few companies do it better than NetEnt, and Dragon Island is another example of an online slot machine in the Vegas slots style that you can play for free and have a lot of fun with it. This is a good game in its own right. Of course putting your money on the line makes any experience tenser and more engaging, and NetEnt lets you risk as much as 15 coins per spin. The game has five standard reels and 15 pay lines. The small coin size is a cent, and the max size is 0,50 coins. A Max Bet button lets you set that max coin size for particular online casinos, but you’ll have to adjust the line count independently if you’ve changed it from the default. The game also has an auto play mode that will spin up to 100 times and that you can pause at any time but which won’t suspend automatically just because there’s a win unless there’s free wins involved. 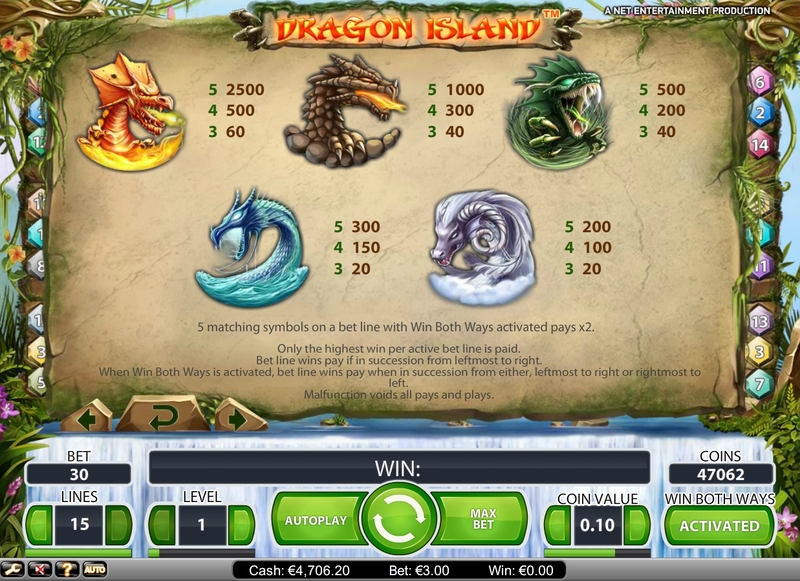 Dragon Island was developed by NetEnt as a flagship game for the Win Both Ways feature, which is usually how the company introduces new features into its library. The game does a good job of being engaging while also being simple enough to let WBW shine and be easily understood. The theme here is dragons, and the game paints a picture of various dragon species vying for habitat in the limited space of this island. 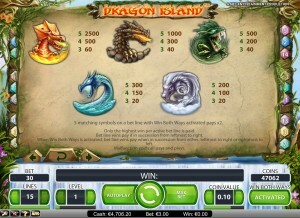 The island features fire dragons, bronze dragons, emerald dragons, water dragons and ice dragons. Each dragon type is represented by a standard symbol. There’s a volcano on the island as well as dragon statues, which hint at some primitive human tribes that worship the dragons as gods. The game also features the standard A, K, Q, J and 10. 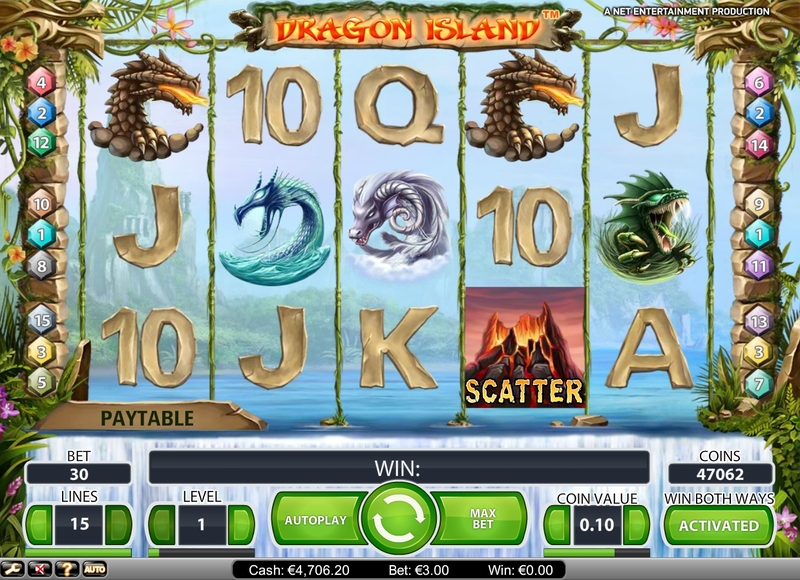 Dragon Island by NetEnt has a Win Both Ways mode that is activated by default but that you can choose to deactivate and activate at any time between spins. When activated, a Golden Wild is added to the symbol set and you can win both ways. Golden Wilds are like standard wilds except that wins are increased by a multiplier between x2 and x8. Standard wins pay from leftmost to right, but in Win Both Ways mode, they can pay out from rightmost to left as well. Both the standard wild symbol and the gold version can substitute for any non-scatter symbol. The volcano is the scatter symbol. With three or more scatters, you win 10 to 50 free spins. During free spins, you have an additional wild that covers the entire reel it’s on and appears on one reel before every free spin. 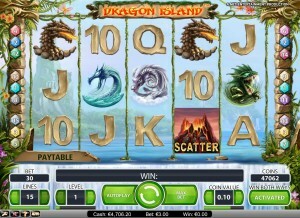 NetEnt knows how to make engaging slot games, and Dragon Island, which is available on SlotsClub.com, is no exception. This game doesn’t have the 3D elements that many NetEnt games do, but the aesthetic is fantastic and the animations and sound effects are strong. The game could do with some music to set the stage, but if you listen to your own tunes while playing, this isn’t an issue. Being able to deactivate Win Both Ways isn’t much of an option, but since you can play with all lines and that mode active for as little as 0,30 coins, it isn’t much of an obstacle either. Winning left to right is fun and different, and the bonus mode guarantees a nice prize thanks to having an entire reel wild each spin. 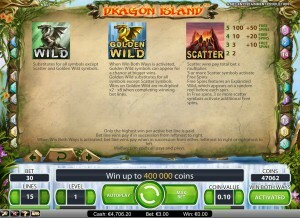 In addition, the scatter remains active during free games, which makes it possible to stack free spins.